I have the pleasure of working with my first example of passion in action. ViVi is a one woman dynamo. I am so honored to get to know her better and share her story. Brenda: How did you come up with this idea? ViVi: It was a magic trifecta of things. I had the kind of job you get educated for and it was very demanding. One where you are working towards six figures and the company basically owns you. I was constantly tethered to my job and working crazy hours. One day I missed Dennis’s receiving his first national art award. (ViVi’s voice cracked as she shared it. It has been 7 years and it still hurts her deeply.) My parents managed to make it. I got there the next day, and Dennis is so sweet he would never say how it made him feel. It was a turning point. It started me thinking: I am not getting any equity out of this job and I am missing important time with my husband and family. I should never work like this unless I own the company. Then, my Aunt was diagnosed with throat cancer. She was in 2 or 3 different hospitals during this time. They had to remove her esophagus. I was watching this lively, vibrant woman fight. I wanted to give her something that she could have in ICU to remind her that God is with her. Every gift shop I went to would have plaques but they are flat and she didn’t have the strength to lift it. There were devotionals, but again she was not strong enough to turn the pages. I knew she loved flowers. I got crafty and made a flower that looked like a ransom note that came out of Buffalo Bill’s basement, it was horrible, and they were so ugly. She was very appreciative and thanked me. 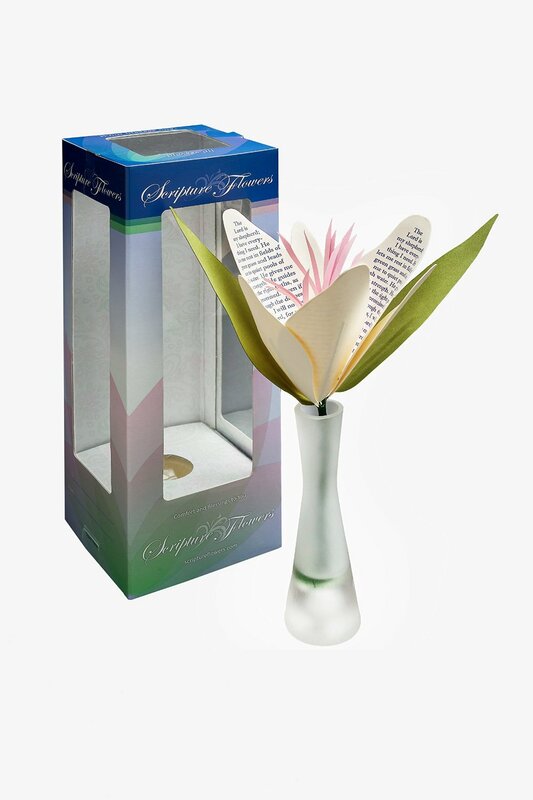 This is when I decided that I wanted to create these Scripture Flowers. I initially decided to source stateside and connected with a charitable institution that did manufacturing. What’s funny is the first one’s that were made by them looked similar to my ransom note flowers. I thought “No, no…This won’t work.” and when I got home I noticed my flowers were just as bad. Brenda: This is no small task, how did you manage to work this into your life and still have such a positive outlook? ViVi: First, I decided to find a job that I could do with much less time and effort, but still financially enough to cover bills and do what I want to do. I needed to be over qualified for the position. This took a year and a lot of patience and a little negotiating to get the position I have today. I feel very fortunate to have a job that is rewarding, working with great people and make good money. My husband, Dennis, is an artist and works for himself so I needed a job where I had stability, insurance and retirement. Brenda: I am completely impressed, because generally men like to solve problems and fix things. ViVi: He really has been so great!! Brenda: How did you come up with the design for the flower? ViVi: I got one of those machines that looks like those old mimeograph machines, where you had to crank it by hand, it has dies that cut out shapes. To make the shapes I would walk around craft stores and people would ask if they could help me. I’d say, “No, I’ll know it when I see it.” Until I found a flower shape that I liked. So I cut out the petals and leaves, wrapped the stem and put these together. My cats would look at me like I was crazy. I initially sourced this stateside, and had the charitable institution producing the flowers. I made very detailed instructions on how to make the flowers. It didn’t end up working out with them, because I could not get a consistent product out, due to turn-over and skill levels. They were a wonderful, professional institution – it just wasn’t a good product match for their expertise. I sent my product to a major distributor of hospitals and they said the focus group didn’t want it. I was puzzled until I realized that there was one major thing I hadn’t considered…PACKAGING. Fortunately, Dennis, being an artist is familiar with this area. We went through various designs before we ended up with the final product. ITI doesn’t normally develop packaging, but they felt so passionately about this product they managed to work it out with us. They were great partners. Be sure to ask for Mike Stewart and LuLu Wang. They are the best! 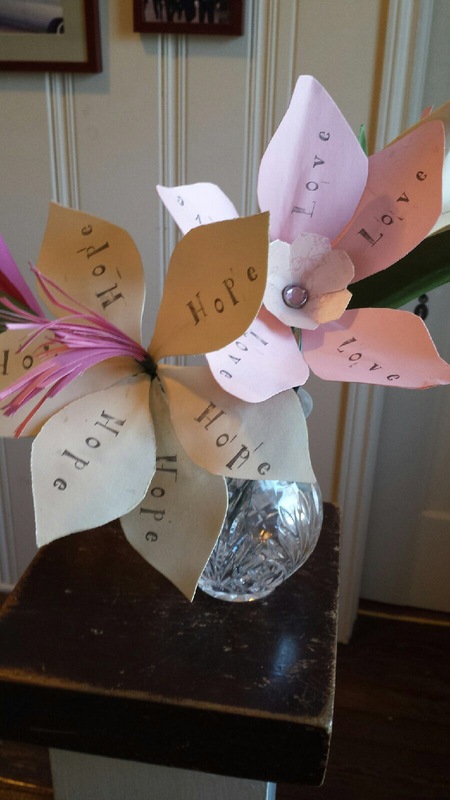 We now have a storage unit full of these flowers and we are selling them on Amazon and at a couple Hospitals in Texas, as well as, Polk-a-dots Gift Shop in Fort Worth. Brenda: What obstacles did you have to overcome? Our first problem was keeping the flower in the vase so it wouldn’t crush during shipping. Our friend Johnny-boy said you should put acrylic in the vase to hold the flower and it would have the benefit of looking like water. So we tried it but when the flower was inserted it created bubbles in the acrylic. It drove the Chinese manufacturing folks crazy, so we decided to frost the vase to hide the bubbles. The packaging was a tail kicker. It took us 2-3 mock ups before we got this right. Finally, when the container was shipping from China, we got a call from ITI and they said we both had forgotten about the “Made in China” stickers on the boxes. They tried to recall the container from the freighter, but it was too late. I was on pins and needles expecting to have issues with customs, but luckily the container sailed right through and ITI mailed 5,000 labels, and we have been spending our evening putting stickers on the boxes. I was the poster child for unintended consequences. Brenda: How did you keep motivated? ViVi: People are my food. I have a group of people that are doing the same type of thing and we are all at different places in the process. We support each other and encourage each other. Also, notes, emails and reviews keep me going. I have the envelope of messages from people and I pull it out and read them and it gives me the energy to keep going. Genice, our tax manager, purchased 2 flowers via Amazon and left a wonderful review. I found out that with Amazon’s restrictions on reviews content they were not showing up on Amazon. I went into my account and I had 6 reviews!! They were all very positive. I got some feedback that this woman had bought a flower for her Dad before he passed, and now she keeps it on her desk. She sees it and talks to her Dad. Brenda: What tips would you give to someone who has an idea, but doesn’t know how to get started? Don’t do a project unless you believe in it. Have a passion for what you are doing. It is not going to be easy and you really have to believe in it. Keep a full-time job that gives you some level of satisfaction, but doesn’t impose on your personal time. I have an alarm on my phone that goes off at 5:00 and I leave at that time. Know what your budget is for your project. Make a plan and know what direction you want to go. Also, remember that you will reach points where you may have to step back and look at things differently and adjust your plan. It doesn’t need to be complex, but know your limits. Do a small scale test to make sure you can afford it. Get buy in from your family. You will be taking time from them to work on this and you may need their help. I am so fortunate that Dennis is completely supportive. He went to the trade show and helped me push flowers. He is a bit of an introvert with strangers, so he was 3 zip codes outside of his comfort zone. I read “The 4-Hour Work Week.” which basically taught me that I needed to find resources that would help me meet my goals without consuming all my time. My parents are aging and I want to spend time with them. Dennis travels a lot for work and I like to travel to see him and just have me time. So, I suggest that you look at how you are doing things so you don’t trap yourself in a cage. I trade a little more money to have Amazon do my packing and shipping so I am not stuck doing it nightly. Think about how you are going to sell your product or service. The world of sales is changing. The internet is changing how people shop. I haven’t figured that part out yet. We are still working on that part of the story. Eat the elephant one bite at a time. I made my password a goal. I have to type it all the time. It’s a great reminder. Brenda: What about this journey has affected you the most? ViVi: I have so many favorite moments, but my favorite was the first time my Aunt saw the flowers, finished product. My aunt had no idea that we dedicated them to her. We drove over to give my aunt and uncle their flowers. We handed them the flowers and they read the story on the back. We watched their lips as they read the story and we all started crying at the same time. Brenda: How do you deal with something that feels like failure, but is really just an obstacle? ViVi: Keep in touch with your support group. Surround yourself with people who can help you through. Remember it’s not the end, it’s just time to step back and see if there’s another way of doing it. Brenda: Thank you, ViVi, for taking the time to share your story with me. I enjoy working with you every day! ViVi: Thank you, Brenda, for making this possible. I am going to put some links and resources below that I know about or ViVi has mentioned. I was born with an entrepreneurial spirit, so I have always had dreams and endeavors, some of which I have acted on and some I never did. I come from a very conservative family. I am officially the risk taker and I don’t think they really know what to do with me. If you put me in a box I will kick a hole in it and crawl out. Mint.com – I would set up a separate bank account for your business and use mint to track the expenses, you can set a budget, track tax related expenses and get a weekly summary of your account activity. Your local Chamber of Commerce is great for networking. page for photos. They also offer website services (Design and Hosting). They are actually pretty good. If you are looking for someone to host your website, be careful. I have had many of them and outside of a company like Vista Print they eventually drop off the radar and your stuck. Get a referral and make sure you have a back-up so you don’t lose everything. Host Gator: Great for snagging and keeping domains. Shopify: Awesome check out cart software that gives you a free site with your cart. They have a great fee structure. Squaretrade: They give you a free reader with no monthly fee to accept credit cards. They will have a little higher transaction fee, but if you use infrequently, they are the bomb!! Amazon for distributing your product: They are not cheap, but they do provide a wide variety of services and have a large following. Know the kinds of keywords you need to use to drive traffic to your product. “The Power of Vulnerability” by Brene’ Brown – This book has helped me step out of my comfort zone. Starting a business involves being vulnerable. I love this book and it is available on Audible and is narrated by Brene’ Brown. Your local library. You would be amazed what they offer these days. Genice is designing a product and at her tiny local library had a 3-D printer!! Seriously, that is so cool. Consider using graduate students at your local university to help them and a more cost effective way of getting assistance with engineering, marketing, sales, and photography to name a few. Comment with any questions you might have for ViVi or me. Brenda The Avenger on What is Love?